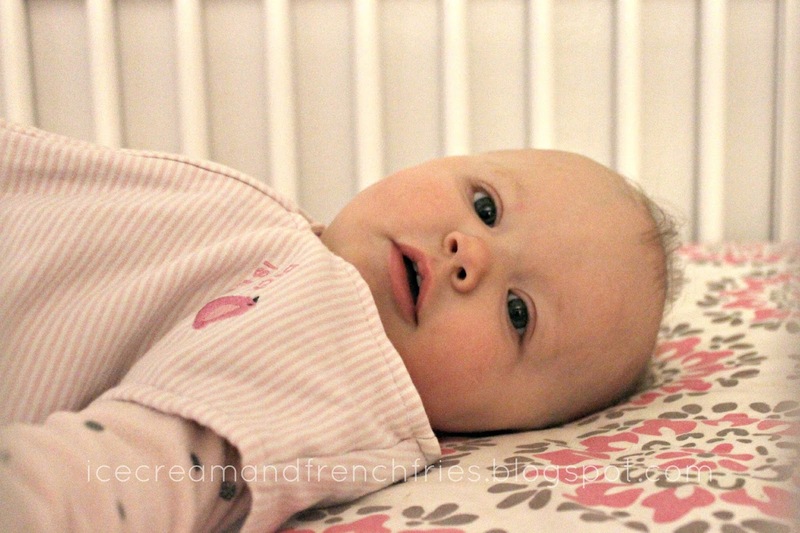 Happy Healthy Home: Safe Sleeping Tips + HALO SleepSack Giveaway! HALO Innovations (the maker of the HALO SleepSack and HALO Bassinest) is running a “Then & Now” campaign during Baby Safety Month (September) to generate awareness about children's safety today. infographic showing the differences between then and now. So how do we go about educating our parents? HALO has partnered with First Candle to promote a brand new website targeting grandparents. 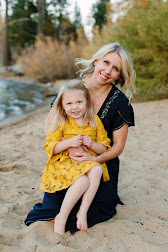 The site shares safety information and advice aimed specifically at grandparents caring for their grandchildren. The site also offers a free e-book for download: "A Grandparent's Guide to a Safe Sleep Over". This guide focuses specifically on sleep safety, an area that is of particular concern for HALO. Enter HALO SleepSacks -- we love them and have from the very beginning. Check out our full review HERE. There's nothing better than peace of mind. We can sleep soundly knowing Emerson is sleeping safe and sound in her HALO SleepSack wearable blanket. When Emerson goes to a nanny we send a sleepsack with her. By providing the nanny with a sleepsack we're ensuring she isn't covered with a blanket during nap time. + Place baby to sleep on his or her back at naptime and at night time. + Use a crib that meets current safety standards with a firm mattress that fits snugly and is covered with only a tight-fitting crib sheet. + Remove all blankets, comforters and toys from your baby’s sleep area (this includes loose blankets, bumpers, pillows and positioners). The American Academy of Pediatrics suggests using a wearable blanket instead of loose blankets to keep your baby warm. + Offer a pacifier when putting baby to sleep. If breastfeeding, introduce pacifier after one month or after breastfeeding has been established. + Breastfeed, if possible, but when finished, put your baby back to sleep in his or her separate safe sleep area alongside your bed. + Room share, but don’t bed share. Bed sharing can put a child at risk of suffocation. + Never dress your baby too warmly for sleep; keep room temperature 68-72 degrees Fahrenheit. + Never allow anyone to smoke around your baby or take your baby into a room or car where someone has recently smoked. As part of Baby Safety Month, HALO is kindly offering one lucky reader a HALO® SleepSack Swaddle or HALO SleepSack valued at $25-30! To Enter: Please use the Rafflecopter widget below to enter (it might take a second to load, but it should eventually pop up below this paragraph). This giveaway is available for USA & Canada residents. Please note, only entries via Rafflecopter will be eligible to win. Thank you and good luck! I love HALO- we used the swaddles when my kids were babies but now my little guy is 7 1/2 months old and naps and sleeps in a sack!! Our first little one is on the way! Would love to win this! This is a must on your baby list. Can I get this in adult size? ;-) I'd love the green one. Sage is a beautiful color. great giveaway! 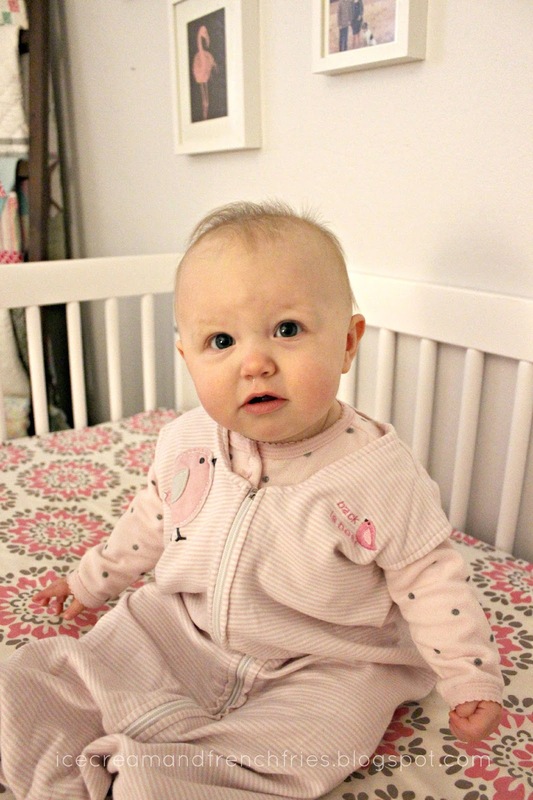 violet loves her sleepsack and has almost grown out of it! i love the elephant print. We had to go up a size a few weeks ago. I love the Giraffe Yellow swaddle sack! Would love to win this for my 8 week old! I am wondering if a sleep sack would help our little guy from flailing around as much and keep him warm at the same time. Would love to try one out! Lauren -- I think it would help. Emerson doesn't move around as much and sleeps much better when wearing her sleepsack. Good Luck! I like the striped hearts sack. I love the one with the precious elephants on it but if I won I know I would have to give it to my sister and she would want one that was all pink. The one your daughter is wearing is so cute!! 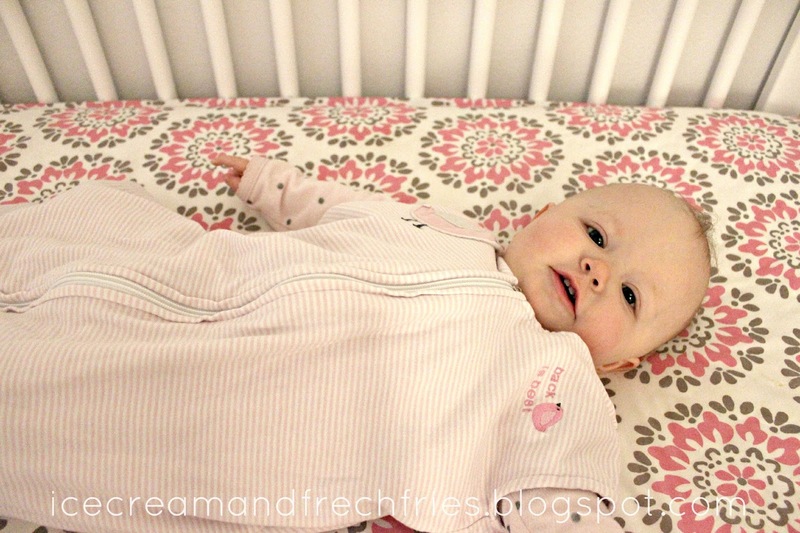 Sleepsacks are definitely the best in keeping baby covered and so easy to use for diaper changes! My first baby is on the way. I am excited to say my hospital only allows the use of the Halo sleepsacks they provide. I hope to get a few myself to use when we get home! Congrats on your first baby! That's amazing. More hospitals should do that! I would get the HALO SleepSack in pink paisley! We have that one too! So cute. They are all very nice!! I would choose the 100 percent cotton Halo sleep sack in the yellow jungle pals.